When scrolling through Instragram one day, I saw the below photo and I thought that it was such an amazing idea. 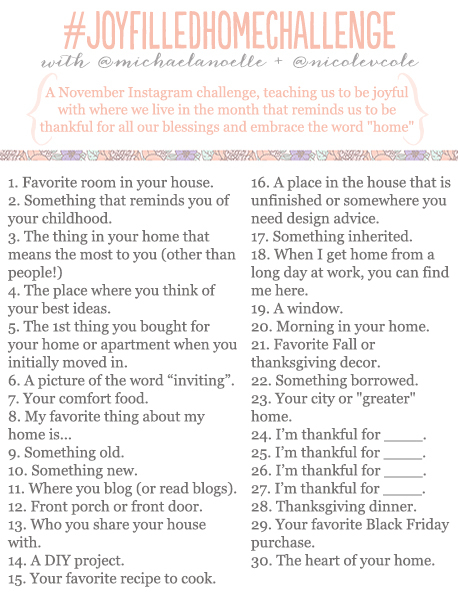 For the month of November I am jumping in and joining Nicole and Michaela with their Joy Filled Home Challenge. November is such a hectic month, we are all rushing around seeing family and getting ready for Thanksgiving that I know sometimes I have forgotten what the true reason for Thanksgiving is. The Joy Filled Home Challenge for me is to step back and remember what I love so much about my home. I get so consumed with making my house look pretty that I fail to remember that it does not have to be perfect. I am thankful to have a home to come home to, when there are so many out there who don't. We have made some special memories in this home over the past almost 2 years! I hope that y'all enjoy sharing with me in the Joy Filled Home Challenge. I would most certainly have to say that my favorite room in my home is our Master Bedroom. I have put much love into picking out everything that we have in there. I enjoy coming home and sharing this room with my husband, and BOTH of my dogs. Yes, all 4 of us sleep in the queen sized bed. A king sized bed is on our to-do list in the future. See my adorable picture of my husband! I love looking at this each night before I go to bed and when I get up each morning! It is a wonderful reminder of our wedding day! My Mother in Love started this collection of love pictures! She got me the bottom for Christmas a few years ago! It is 1 Corinthians 13, it means so much to me since it was read at our wedding. The one on the left is also from my wonderful Mother in Love! The right we got as a wedding gift and the top I got in Tennessee on our last vacation. I love seeing our married monogram! It warms my heart! I get to share my life everyday with my best friend and husband! Thankful doesn't begin to describe how I feel toward our master bedroom. It is my place to relax and read a book or blog or just hang out with my husband and my fur babies! It is where I go when I am sad, happy, tired or overwhelmed. I share this space with some of the most important people in my life. I hope that y'all have a wonderful Friday! I love the simplicity of your home so beautiful!!! I'm a southern belle myself so I love monograms !! What part are you from? I just found your blog! !